David was born and raised in North Norfolk. He is co-owner of Art Café, a vegetarian eatery and gallery which has just celebrated it’s third anniversary. 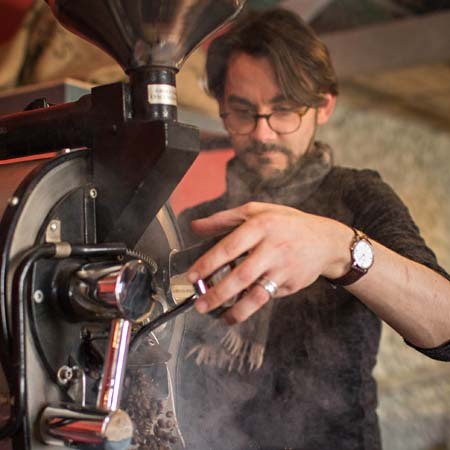 He is head roaster at Grey Seal Coffee, North Norfolk’s artisan coffee roastery. He is also a classical pianist. Richard Scott Antiques, Holt – full of exquisite glass and china beautifully displayed with a charming proprietor. Chai Yo Thai Restaurant in Sheringham – seriously good vegetarian options and super friendly service. The ancient woods around Bayfield Hall recently enhanced by a brand new stretch of the river Glaven. Thornham, often overlooked and totally unspoilt. You can still sense the presence of Seahenge. Spring in Norfolk is stunning: the smell of blossom on the air, bright green leaves and bluebells carpeting the woods. I helped the RSPCA to rescue a seal pup from Salthouse beach on Christmas Day – rather apt considering the name of our coffee company. There is a sense of being in a remote wilderness, a chance to escape to the middle of nowhere but with the benefits of civilisation never being too far away. The wildlife: hares, deer, otters, seals and osprey.